There are so many miraculous firsts when it comes to babies. Watching your baby roll over for the first time; Watching your baby Laugh for the first time. ; Watching your baby can catch something for the first time, etc. Walking is an important milestone in baby’s growth, if the baby hasn’t accomplished this major milestone, he will be different from the others. Learning to walk is a slow process, but in this process, our parents need to pay attention to these things.  When should the baby learn to walk? The following five stages, mothers should know. This stage is the first stage for the baby to learn to walk. When the baby can stand stably by support, and even can stand alone for a while, he can begin to practice walking. The practice of squatting is an important process in this stage. 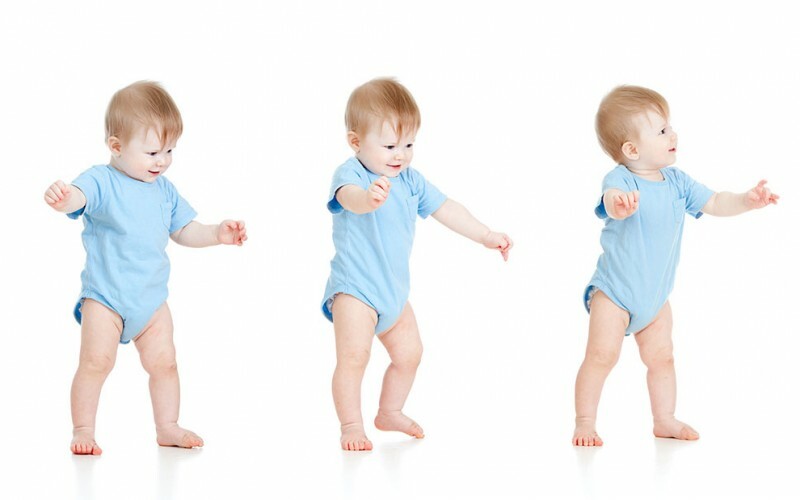 The baby needs a stand – squat – stand coherence exercise so that makes the baby’s leg muscles powerful. In addition, don’t forget to train the baby’s body coordination. At this time, the baby can walk very steadily with the aid of something, then you need to let go of the baby’s hand, let the baby step by himself, and meanwhile, strengthen the baby’s balance training. At this time, in addition to continuing to train the strength of the baby’s legs and the coordination between the body and the eyes, we should also focus on the training of the baby’s adaptability to different ground. At this time, the baby has been able to walk well. The curious baby love to look around while walking, the baby may fall accidentally.  Should we buy the baby walker for baby? Most of the articles I’ve seen on parenting forums are encouraging parents not to use the baby walker, they think the baby walker will prevent the baby from learning to walk. I think they have some misunderstandings about the baby walker. The baby walker is only an auxiliary role in learning to walk and protects the baby from falling down while walking. After all, the mother can’t always notice the baby. Of course, some experts study found that the baby using the baby walker started crawling, standing alone and walking will later than the baby without the walker for three to four weeks. Therefore, when to use a baby walker, how to choose a baby walker is important. The baby is at least eight months old and has normal development. Keep a safe distance so that the baby can not approach other dangerous goods. Just sit for a short time in the beginning and then gradually extend it.  How to choose the proper walker? Choose a baby walker that provides the extra function for the baby, Some walkers will include pallets or toy accessories to allow the baby to play while they are in the walker. Choose a baby walker which can adjust heights so that the height of the walker can match the baby’s leg height, Prevent O-legs and will allow baby to enjoy the walker for several months. Choose a baby walker that allows your baby use easily, Such as the baby walker with 6-8 big universal wheels. Choose a folding baby walker, the folding baby walker is easy to store. This entry was posted in children scooter. Bookmark the permalink. Why Is Blue for Boys and Pink for Girls ?